NCL has a small number of basic extreme value (EV) and recurrence statistical functions. However, NCL is not R or S+ or Matlab or IDL or Excel or Python's SciPy. These tools contain many more EV related functions. That said: none of these tools is NCL either! The Gilleland et al reference below provides an overview of selected EV software. Extreme value theory (EVT) is a branch of statistics dealing with the extreme deviations from the median of probability distributions. There exists a well elaborated statistical theory for extreme values. It applies to (almost) all (univariate) extremal problems. From EVT, extremes from a very large domain of stochastic processes follow one of the three distribution types: Gumbel, Frechet/Pareto, or Weibull. The GEV allows for a continuous range of possible shapes. 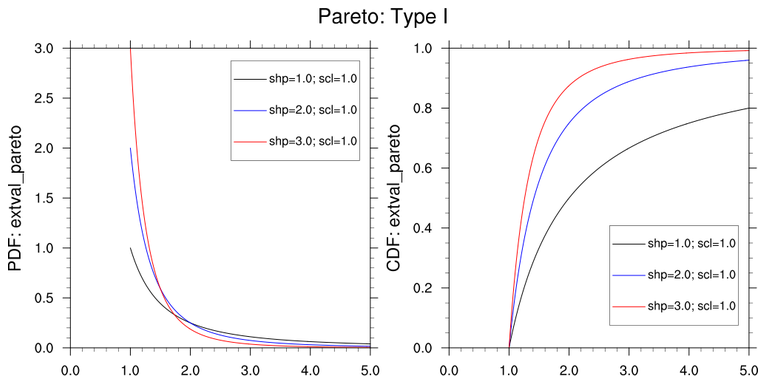 The shape parameter, S, governs the tail behavior of the distribution. The sub-families defined by, S ~ 0, S > 0 and S < 0 correspond, respectively, to the Gumbel, Frechet and Weibull families. 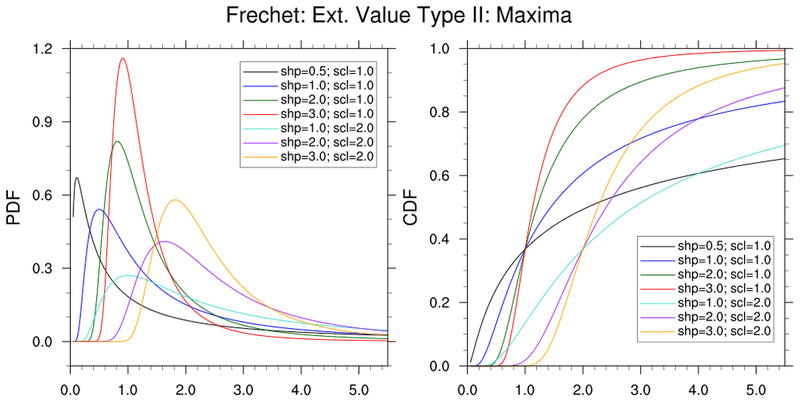 Note the differences in the ranges of interest for the three extreme value distributions: Gumbel is unlimited, Frechet has a lower limit, while the reversed Weibull has an upper limit. The GEV facilitates making decisions on which distribution is appropriate. 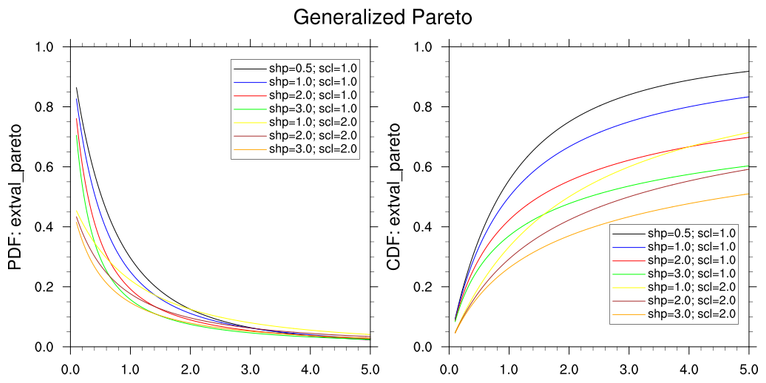 The GEV distribution is often used as an approximation to model the minima or maxima of long (finite) sequences of random variables. 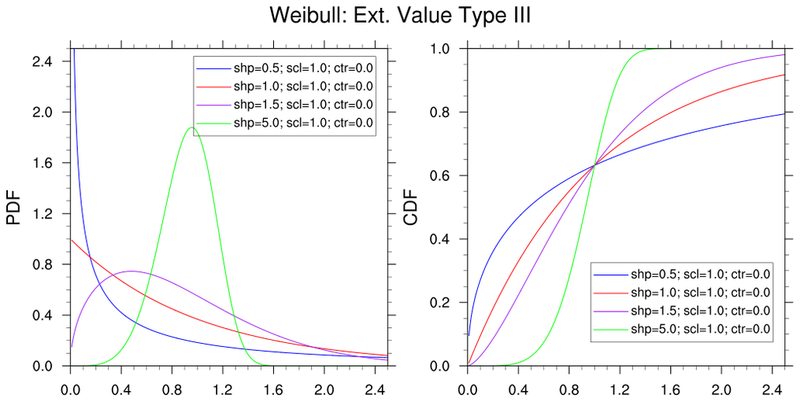 In general, the GEV distribution provides better fit than the individual Gumbel, Frehet, and Weibull models. For example, in most hydrological applications, the distribution fitting is via the GEV as this avoids imposing the assumption that the distribution does not have a lower bound (as required by the Frechet distribution). The maximum value (or last order statistic) in a sample of a random variable following an exponential distribution approaches the Gumbel distribution closer with increasing sample size. In hydrology, therefore, the Gumbel distribution is used to analyze such variables as monthly and annual maximum values of daily rainfall and river discharge volumes, and also to describe droughts. 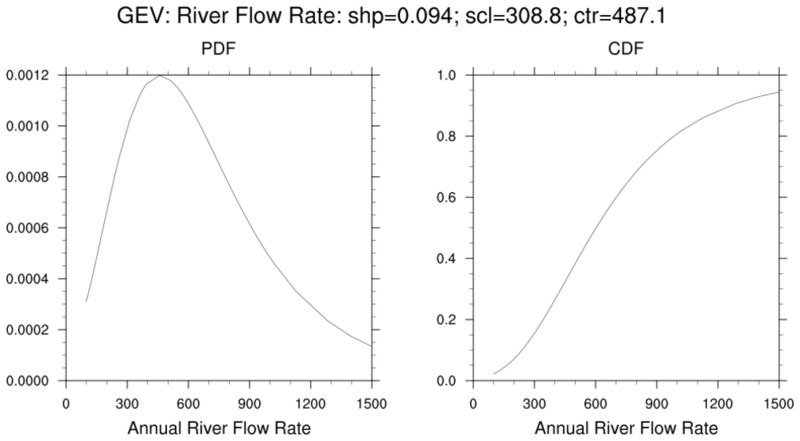 Example 6 (below) offers a sample block maxima approach based on extracting the maximum rate of river flow ineach year. An estimate of the likelihood of an event, such as a flood or heat wave, is commonly called the return period. However, other terms are used, including: repeat interval, recurrence interval, exceedance probability, expected frequency and return interval. These terms are synonymous. Coles, S. (2001): An Introduction to Statistical Modeling of Extreme Values. Gong, S. (2012): Estimation of hot and cold spells with extreme value theory. U.U.D.M. Project Report 2012:19 (Uppsala Universitet). Statistics of Extremes in Hydrology. Advances in Water Resources: 25: 1287–1304. Rieder, H.E. (2014):  Extreme Value Theory: A primer. Wilks, D. (2006): Statistical Methods in the Atmospheric Sciences. Academic Press. The extval_mlegev and extval_mlegam provide maximum-liklihood estimates of these parameters for the GEV and Gamma distributions, respectively. The method of moments can readily be used to derive parameter estimates for other extreme value distributions. However, the moment method ahs some issues (biases). Note: The extreme value Type I distribution has two forms. One is based on the smallest extreme ('minima') and the other is based on the largest extreme ('maxima'). 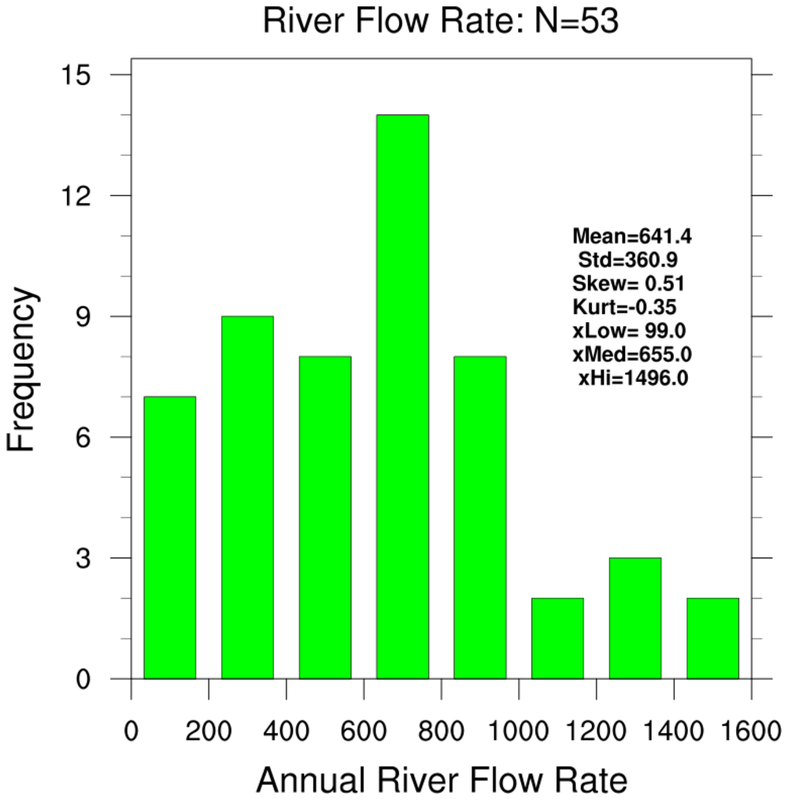 Examine 'Maximum Annual River Flow Rate' data using graphics and conventional statistics. Derive the shape, scale and center (location) parameters using the extval_mlegev function. 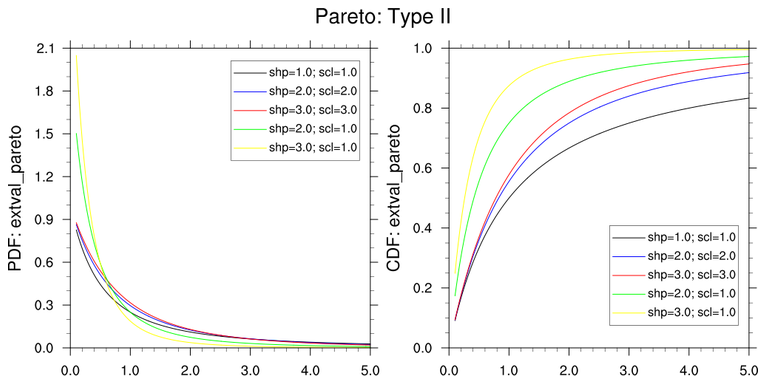 Using the returned parameter estimates calculate the PDF and CDF associated with the GEV distribution using the extval_gev function. The shape parameter is near zero (S=0.094). Hence, the distribuion is similar to the Gumbel distribution. This example can be viewed as a 'block maxima' approach. 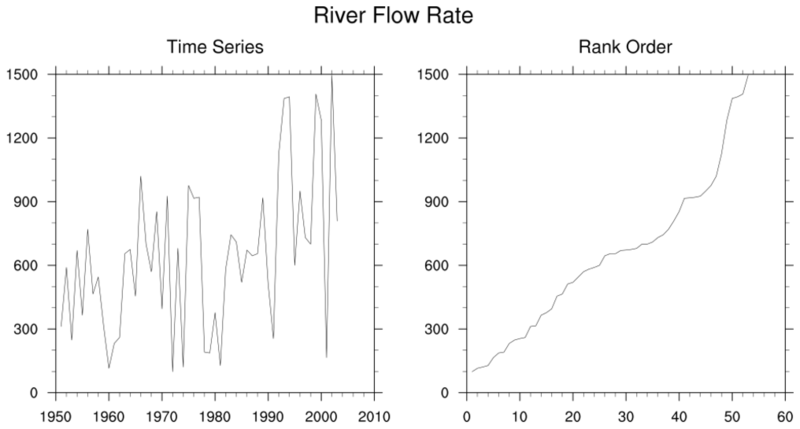 Here the maximum river flow rate is recorded for each year. This selected subset of maximum flow rates was used for the statistics. Example 5 for the extval_recurrence_table uses the the same data. It provides a 'table-based' approach to examining the data.